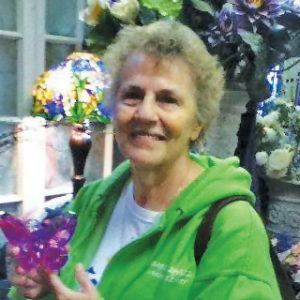 Tag Archive | "Courtland Township Fire Department"
A Greenville woman died last Friday after a crash at the intersection of Northland Drive and 14 Mile Rd. According to the Kent County Sheriff’s Office, the crash occurred about 8:30 p.m. September 7. A 2010 Ford Escape driven by Opal Fugitt, 74, of Greenville, was headed south on Northland Drive in the left hand turn lane to head east on 14 Mile, and a 2003 Honda CRV, driven by Joshua Lange, 28, of Cedar Springs, was headed northbound on Northland Drive, when the two vehicles collided in the intersection. Both drivers were taken to the hospital by ambulance with apparent broken bones. Mrs. Fugitt later died at the hospital. Police said neither alcohol nor drugs appear to be a factor. Courtland Township Fire Department and Rockford Ambulance both assisted at the scene. A new left turn light was recently installed at that intersection. The Post asked police whether Mrs. Fugitt had a green arrow to turn, but they said the crash itself and cause are still under investigation. Courtland Fire and Rescue recently purchased this automatic chest compression device to help give CPR when patients are in cardiac arrest. Courtesy photo. 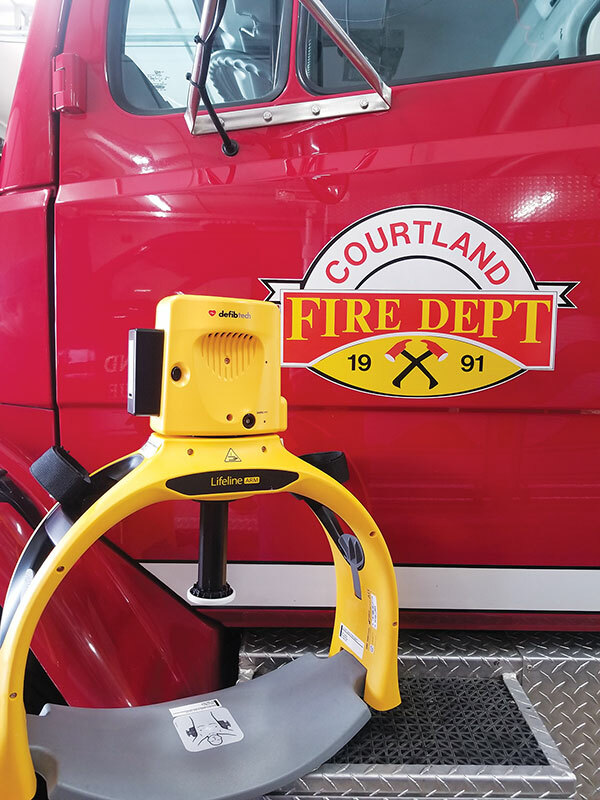 An automatic chest compression device that Courtland Fire and Rescue recently purchased is already doing the job they hoped it would do. “We used it on Sunday’s car accident and it returned a pulse with the help of Rockford Ambulance,” said Courtland firefighter Gabriel Skelonc. 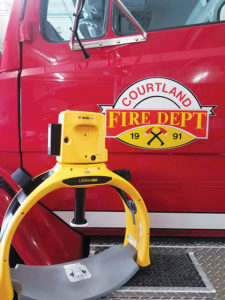 The department purchased the Defibtech with Lifeline ARM for $11,549, with the help of the Courtland Fire Ladies Auxiliary, Courtland Township board, and Courtland Township Fire Department. Skelonc said that The Lifeline ARM is an automated, portable, battery-powered device that provides chest compressions on adult patients who have cardiac arrest, and is intended for use by qualified medical personnel certified to perform CPR. And when staff on call is limited, it’s a lifesaver for both patients and fire personnel. “CPR becomes tiresome even after a couple minutes and the volume of staff needed can vary widely during the day to day calls. This device can take the place of up to 6 people doing compressions over 100 times a minute at 2 inches,” explained Skelonc. He said that it could also be used in other townships where they are called in for mutual aid. Other fire departments in the area that have a similar device include Algoma, Cedar Springs, Solon, and Kent City. 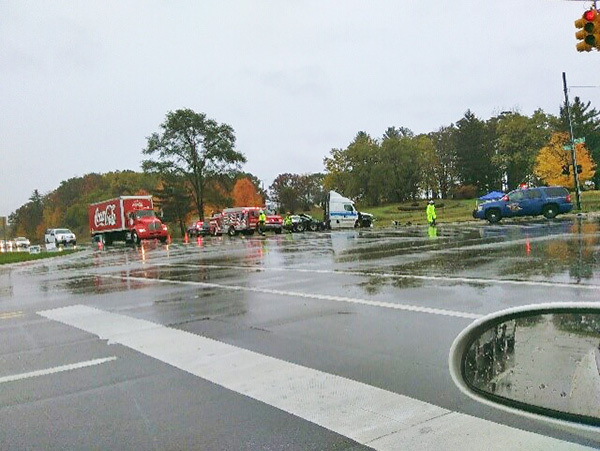 A woman died when she turned into the path of an oncoming semi in Courtland Township Tuesday. Photo from WOOD-TV 8. 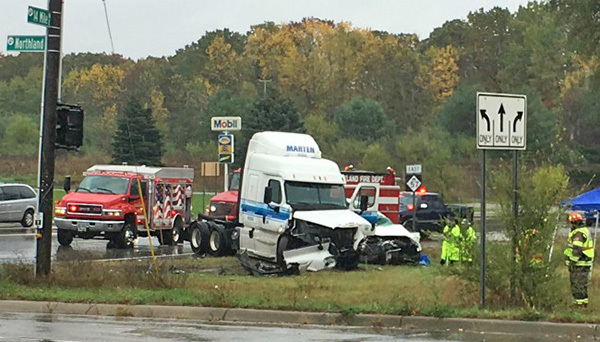 A 77-year-old Grand Rapids woman died Tuesday, October 24, when her vehicle collided with a semi tractor in Courtland Township. According to the Michigan State Police Rockford Post, the woman was traveling westbound on M-57 about 12:25 p.m. in a 2012 Chevrolet Traverse, when she attempted to turn south on to Northland Drive and into the path of a Freightliner semi tractor traveling eastbound on M-57. The woman died at the scene as a result of injuries she sustained in the crash. Her name has not yet been released. The driver of the semi, a 59-year-old Greenville man, was not injured. Police said that neither speed nor alcohol appeared to be factors in the crash. The Courtland Township Fire Department, Kent County Sheriff Department, and Rockford Ambulance assisted at the scene. The Courtland Fire Department was one of the fire departments honored at the American Legion dinner. The evening of February 20 was set aside at the American Legion Post in Cedar Springs as a time to honor the First Responders of the community. 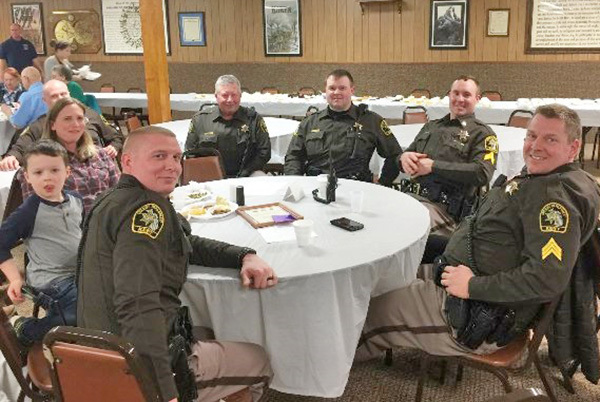 A wonderful Swiss steak meal was provided for our local heroes for their sacrifices, contributions and dedication to public service. Seventy-five attendees from the Sand Lake Police and Fire Department, Solon Township Fire Department, Cedar Springs Fire Department, Spencer Township Fire Department, Courtland Township Fire Department, Oakfield Township Fire Department, Algoma Township Fire Department and the Kent County Sherriff’s Department enjoyed the meal and were given certificates of appreciation. Twenty-five members of the Glen Hill Post 287 Family worked to make this event possible, as well as assistance on items for the dinner from Save A Lot and Kelly’s Restaurant. This month Chief Mickey Davis of the Courtland Township Fire Department announced his retirement from a long and impressive career in fire service. For two decades Chief Davis served both Oakfield Township and Courtland Township as fire chief simultaneously. For the past six years he has dedicated his services to Courtland Township Fire Department full-time. It has been nearly 20 years since Mickey asked me to consider becoming the first chaplain for the two departments he led. Due to his own personal losses, Chief Davis understood that the harm done by fires and accidents goes beyond wounded bodies and damaged property. Often times the greatest injury is to the human heart. In beginning a chaplaincy program, Mickey demonstrated that his concern for the townships he served went beyond putting out fires and securing the emergency scene. =During his tenure, Chief Davis also showed his care for the residents of Courtland Township by delivering toys to children from disadvantaged homes, visiting foster care homes, and directing social services to families in need. He cared deeply for the personal well-being of the people he served. The residents of Courtland Township owe a debt of gratitude to Davis for his unselfish and professional service. He provided leadership in expanding the quality and resources of the township fire service, faithfully protected lives and property, and made the township a better place to live and work. Personally, I wish to express my thanks to the chief for inviting me into a world few know anything about. I have seen the danger and the trauma that firefighters endure as they assist others in crisis. It has been one of my life’s greatest honors to be able to assist Chief Davis and the other members of the fire department in their noble work. I am a better man because of my association with Mickey Davis and the men and women of Courtland Township Fire Department. Thank you, Chief, and congratulations on a meaningful career of faithful service! Chaplain, Courtland Twp. Fire Dept.